Most of my units are with me because they had some influence on the progress of microcomputing in the early days. They were pioneers, and computers of note and esteem. However, the Mattel Aquarius is not one of them. Never has the phrase "Too little, too late" been so pertinent to a microcomputer. Powered by a respectable Z80 chip the Aquarius was crippled with a rubber chiclet keyboard, weak graphics and a meagre 4k of RAM. Not too unusual for an early home computer you might think, but consider the date. 1983. The Commodore 64, with its 64K RAM and full-stroke keyboard had been going for a year. 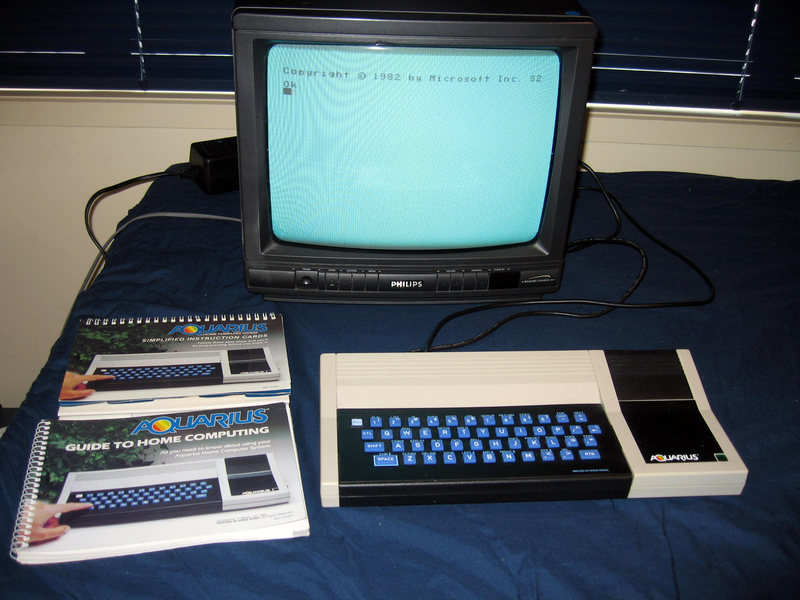 Even the Vic-20 with similar RAM, at least had a full-stroke keyboard and it came out in 1981! As far as the Aquarius goes, the most impressive thing about it is the user manual (and it is actually quite well-written)! The Mattel Aquarius lasted a mere four months, a supreme example of one of the casualties of the great home computer wars in 1983. Consequently, it is part of my collection more for its infamy than fame! Still, it is a rare beast and this one goes and is in excellent condition. Most Aquarius software needs more RAM than the unexpanded model but there are some games which will run in the 4k provided. I have such examples stored on the hard drive on my PC. They work fine. I also have a cartridge...a home finance package but the (as yet unobtained) expander is required to use it.